Test drive Red Hat® OpenShift Container Storage with a full, multi-node Red Hat OpenShift Container Platform cluster running in the cloud. 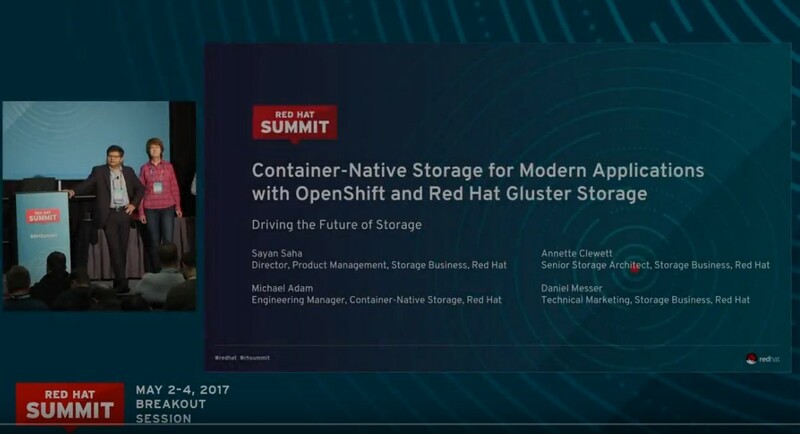 Red Hat OpenShift Container Storage (RHOCS), built on Red Hat Gluster Storage, is integrated with Red Hat OpenShift Container Platform to deploy applications and storage in either converged mode (storage is served from containers deployed on top of an OpenShift Cluster) or independent mode (a stand-alone Red Hat Gluster Storage cluster provides persistent storage to containers). Improve the storage-provisioning experience for app developers through more control and efficiency. Use deployment tools to easily and quickly set up Red Hat Gluster Storage in a containerized environment. Create multiple persistent volumes (PV) and register these volumes with OpenShift. The OpenShift pod then uses the PV for persistent storage on Red Hat Gluster Storage volumes. Deploy for applications on an Openshift pod with shared file storage in a converged infrastructure with compute and storage instances run from the same hardware or on a dedicated Gluster cluster (with or without Heketi) to provision storage. Installation will take about 30-45 minutes. Download the Red Hat Gluster Storage 3.4 and OpenShift Container Platform 3.11 and software. Add the appropriate options and values to the file. The inventory file is provided in the OCP download. Running this file begins deployment. Configure Red Hat Gluster Storage as the backend storage for logging and metrics on block storage. Run OCP commands to make sure your deployment is setup correctly. The glusterfs and glusterblock packages must be installed. You must complete various setup actions for the servers that will provide storage, such as validating RHEL, enabling channels, installing glusterfs and glusterblock, create firewall rules, and make sure the gluster services are running. 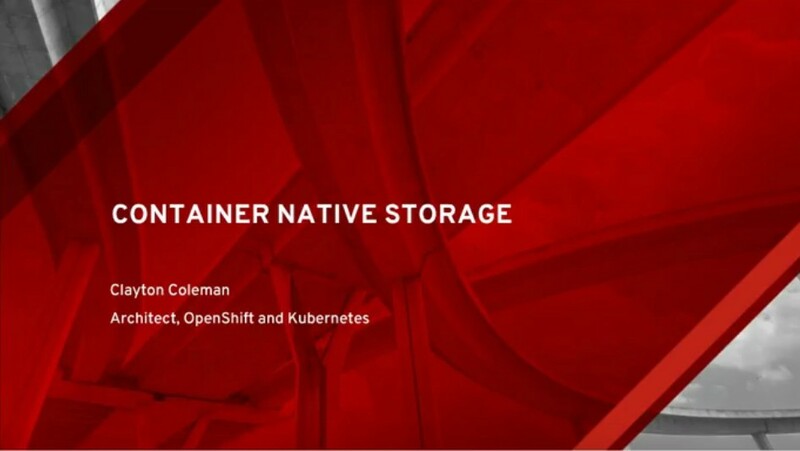 In this video, Clayton Coleman, Architect, Red Hat OpenShift Container Platform, talks about how applications deployed in containers need persistent storage and that Red Hat Gluster Storage offers storage for and in containers. RHOCS is fully integrated with Red Hat OpenShift Container Platform. Sayan Saha, Sr. Manager, Project Management Red Hat and Michael Adam, Manager, Software Engineering, share in this breakout session at Red Hat Summit 2017. Learn how running a storage platform in kubernetes pods is a game changer not just for storage administrators but for application developers as well. 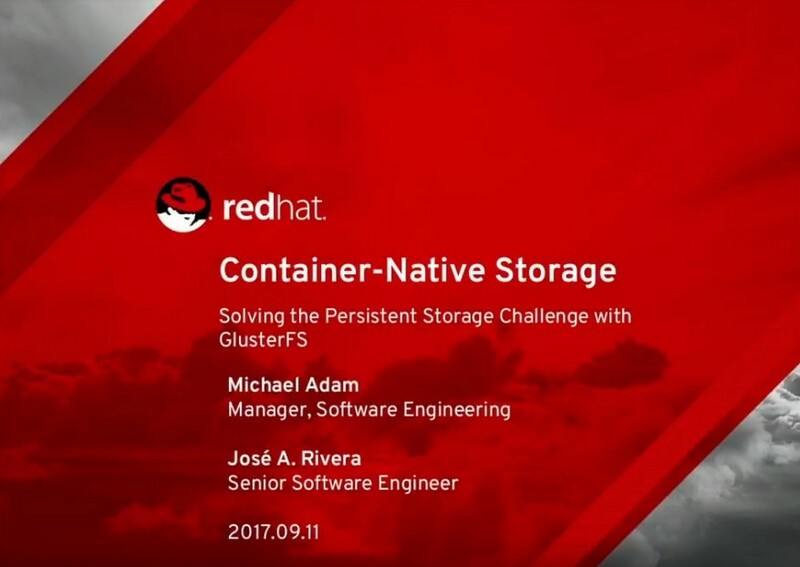 This presentation introduces the problems with persistent storage for containers, describes Kubernetes storage mechanisms, and explains how Red Hat has solved the persistent storage challenge by bringing Gluster into the container cluster. 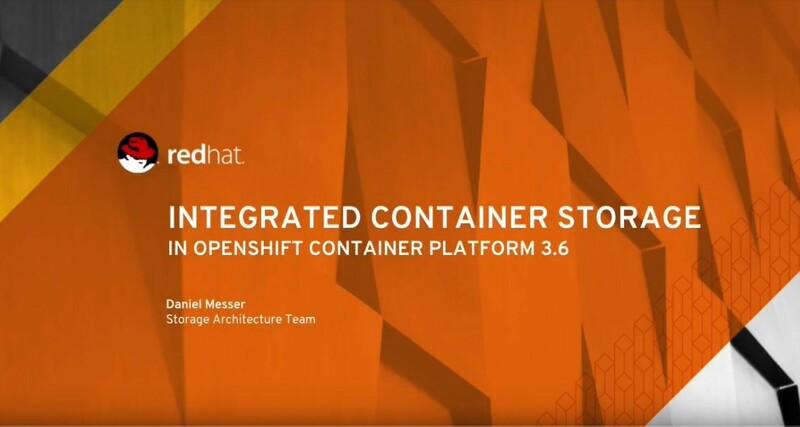 Daniel Messer of the Storage Architecture Team provides a brief demo that explains how, starting with the 3.6 release of OpenShift Container Platform, OCS became even easier. Red Hat OpenShift Container Storage offers subscription services for each major release in three primary phases (Full Support, Maintenance Support, Extended Life) as part of the OpenShift Container Platform life cycle.